Optimal Industrial Automation, one of the UK's leading automation integrators, is now offering Keyence products to provide turnkey vision system solutions that will benefit customers in terms of both software and hardware performance. This new system capability expands Optimal’s traditional portfolio of machine vision offerings to provide its clients with an even wider system choice. With the increased use of machine vision within a wide range of industries this collaboration with a worldwide provider of machine vision systems will help many food , pharmaceutical, automotive and general process, printing and manufacturing companies looking to use this cutting edge technology to integrate new, powerful machine vision products into their existing production control systems. In this wide range of manufacturing and processing industries machine vision systems are more frequently being installed as part of an integrated quality assurance and traceability approach. Everything from reading the labels on tablet blister packets to selecting the potatoes you find on the supermarket shelf. The technological advances in both the hardware and the associated software over the past decade have allowed companies to automate many packing, printing, sorting and quality assurance tasks, while greatly improving productivity and efficiency. The key to a successful system is using the best suited optical package with the correct data analysis technology and processing tools. Optimal has developed its synTI® (synchronised total inspection) product specifically for the integration of disparate inspection systems and printing systems to ensure that the correct batch information is clearly printed on the correct product. This can be expanded to encompass multiple camera systems for any desired inspection task and to produce reports for production control. All of this can be integrated into an existing process management system on a production line. Each machine vision application has its own unique challenges - the trick to a successful outcome is being able to develop the right package for the client. High speed production lines, variations in packaging and lighting requirements all have to be considered when selecting the hardware. This link with Keyence will provide a wider range of products to be used in the solutions being supplied by Optimal. The Keyence vision range is of most significance to Optimal customers, it includes the company’s IV (vision sensor), CV-X (smart camera) and XG (advanced vision) range of cameras, image sensors and image controllers offering both matrix (area) and line-scan application solutions. The new CV-X100 for example offers an image sensor that possesses near-human judgement abilities by comparing with learned acceptable products for more flexible and stable inspection. The CV-X and XG Series offer advanced CCDs, high resolutions, simultaneous imaging and up to 20,000 parts per minute capture speeds. 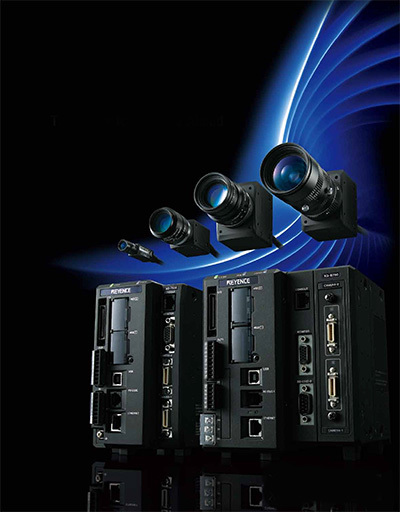 The XG-7000 and XG-8000 packages meanwhile are part of the company’s range of Ultra High-Speed, Multi-Camera, High-Performance Image Processing Systems. They combine robust fanless solid state hardware with super accurate vision and industry leading processing. Being integrated systems there is also less likelihood of compatibility glitches which can occur when using hardware and controllers from a range of different suppliers. The full range encompasses application based offerings aimed from the vision beginner; with vision sensors and easy to use functionality, to the expert; requiring advanced high performance and custom functionality. All products are supplied with as much or as little integration support as the customer requires from Optimal, this ranges from simple specification advice right though to complete turnkey system builds, commissioning and installation onsite.